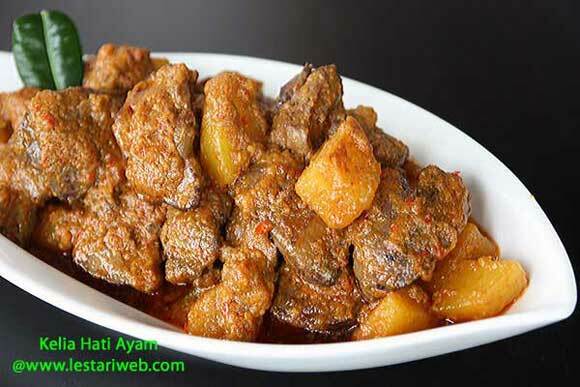 Source: Adaptation from Recipe Book "Periuk Nusantara"
Here it is a typical cuisine from the province of Jambi, Sumatra Island: "Kelia Hati Ayam" or Chicken Livers in Spicy Coconut Sauce. The complete seasoning blends into the chicken livers & potatoes, making this dish tastes savory-delicious with a little touch of sourness. 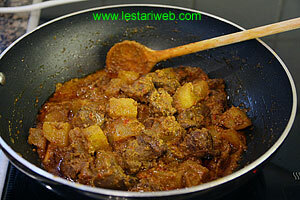 It's similar to Sambal Goreng Kentang Hati from Java but with a little touch of cumin, ....the aroma is soooo inviting!! Honestly I like this dish since I made it for the first time as another alternative of Sambal Goreng Kentang Hati as I mentioned above. 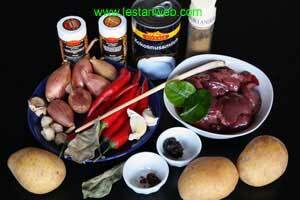 Note: Chicken liver can be replaced with beef liver. 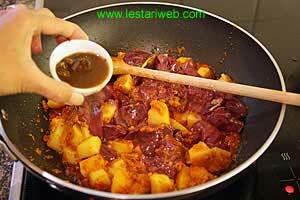 If preferred, potatoes can be subtituted with gizzards or take both into the recipe. For you who are strange with innards, just replace with beef or chicken. This sauce tastes really superb, doesn't matter what you cook with. 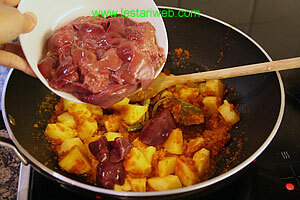 Cut the chicken livers in half. Keep aside. Peel-off the potatoes, diced & soak in water to prevent brown colour. Set aside to drain shortly before using. Soak the tamarind pulp in warm water. Squeeze the tamarind pulp constantly to extract the flavor into the water. Drain the pulp and save the tamarind juice. Heat 2 tbsp used oil in a wok or shallow pan. (Don't add oil if already added during a blending process). 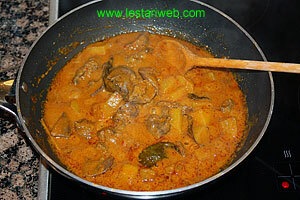 Add the potatoes and chicken livers. Cover the pan & bring all until half-cooked. (approx 15 minutes). Add tamarind juice & salt. Pour in the coconut milk and stir to mix. Continue to simmer over medium heat until well cooked. Stir occationally. Adjust the seasoning, if necessary add the salt and sugar to taste. 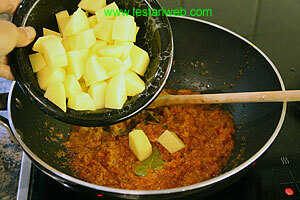 (Ensure that the potatoes not too soft/overcooked). 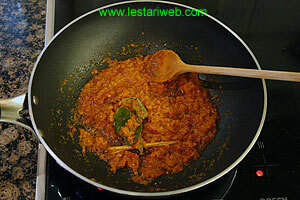 Remove from stove and serve hot.